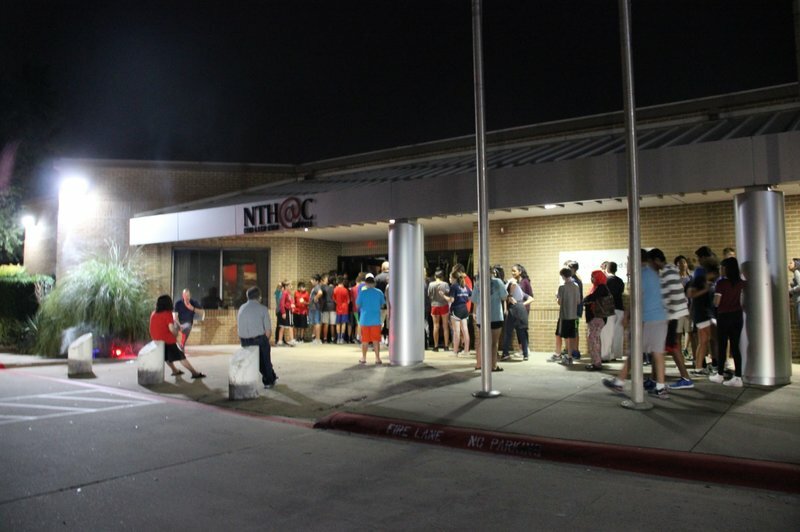 Coppell ISD students wait outside New Tech [email protected] to enter the annual haunted house on Thursday, Oct. 27. The haunted house included themed rooms with clowns and other scary figures. Photo by Hannah Tucker. Fall is for freaky, fun Halloween events celebrated every year. New Tech [email protected] continued this tradition on Thursday with its annual spooky haunted house fundraising event that gives a heart-pounding rush. It takes about seven minutes to go through multiple rooms that includes clowns, zombies and horrifying doctors. There were up to 70 participants who made the haunted house into a success. The realistic Halloween makeup was done by [email protected] senior Peyton Pelham and decorations including fogs, creepy LED lights and insects that were helped set up by volunteers. Last October, [email protected] sophomore Kayla Madureira had volunteered as a zombie but this year she was excited to share her experience as a clown. “I thought it was pretty funny to watch the kids scream their heads off by just one glance at my face and that didn’t happen last year,” [email protected] sophomore Kayla Madureira said. Anyone was allowed to come in to enjoy their time at the [email protected] haunted house for a $5 charge. Coppell High School chemistry teacher Chris Stricker attended the event with his family for the first time. The [email protected] haunted house helped create a remarkable mark in the Coppell community by bringing friends and families together with laughs, smiles and screams.